Happy Monday friends! How was your weekend? I swear it was just Friday afternoon and here we are again at the start of another week. To me, Monday is a great time to reflect on the previous days and start the new week fresh. I don’t know why but I always view Monday as a day for a fresh start and am much more likely to start healthy habits on a Monday than any other day. Since I am terrible at anything other than coffee for breakfast, this is my intention for this week. 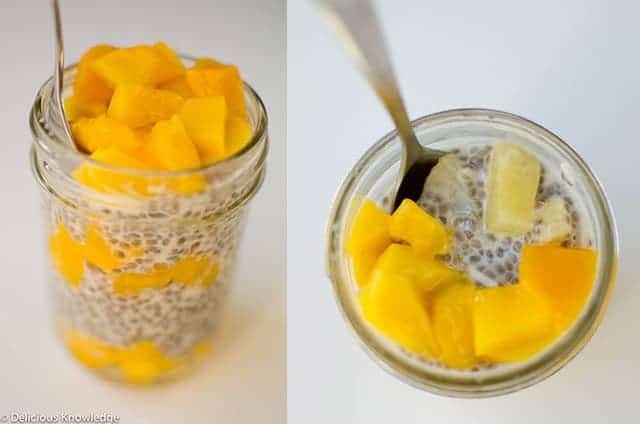 Making my goal as easy as possible, I’m turning to make-ahead meals like this coconut mango chia pudding. 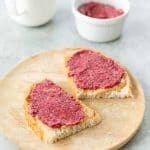 While chia seeds have taken the blogging world by storm, I know that many of my clients have either not heard of chia seeds before or are nervous to try them. I get it. They don’t exactly look appetizing and I am of the firm belief that if you don’t have a recipe in mind when trying out a new item, you’re probably not going to buy it. Please let this recipe be the one that convinces you! It’s so easy & packed with nutrients that I want everyone to try it. As I was dishing it out, BL was quite the skeptic. Like I do with everything he turns his nose at, I sat him down and begged him just to take one bite. Just one. After the second bite, he took the jar from me and finished it. Let me introduce you to the chia seed. While there are lots of benefits into adding this little gem to your diet, I’m a fan for two reasons: fiber and omega-3 fatty acids. 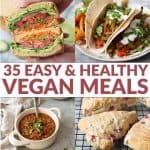 While a lot of us think we consume lots of fiber (and if you follow a plant-based, whole food diet you probably do), the average American only gets 10-15g of the recommended 25-35g amount. Thankfully, a 1 oz. serving of chia seeds will provide you with 11 grams, enough to close the gap for many. I love them best in a pudding or jam, but sprinkle away on cereals, oatmeals, smoothies. Omega-3 fatty acids are the good, heart-healthy fats that most of us either don’t get enough of or not in the right ratio. Chia seeds are a powerhouse of Omega-3’s, 5g in a 1 oz. serving. For my vegan and vegetarian friends, consider the sources of plant-based Omega-3’s in your current diet. If you need a boost, try chia seeds! In Sacramento, I find the best price at Trader Joe’s. If you can’t find them in your local grocer, try online. You only need a few tbsp. per recipe so a bag will last you a while. Ok. Enough nutrition talk. Let’s get to the good stuff. This pudding is so, so delicious and tropical! Don’t blame me if you start googling trips to Jamaica or Hawaii after making this. Filled with coconut, mango, and pineapple it’s the perfect winter escape. Just like overnight oatmeal, the ease of the recipe couldn’t be easier. Throw all ingredients into a mason jar at night and pop into your lunch bag in the morning. A creamy, dairy-free pudding made with coconut milk and mango. Combine together coconut milk, chia seeds, shredded unsweetened coconut and maple syrup. Cover and place in the refrigerator overnight or at least 6 hours to gel. I buy my chia seeds at TJs too. I recently saw our Whole Foods added them to the bulk bins, but I’m not sure how the price compares. Either way, it’s a good way for someone new to chia to try them out. I’m not very creative with mine; I usually just put them on top of oatmeal. 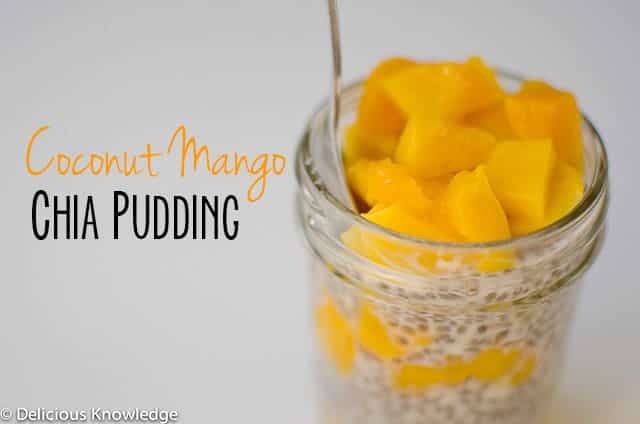 I’d love to try this pudding – it sounds so delicious and makes me think of summer. When you say coconut milk beverage, do you mean the kind sold as a non-dairy alternative (in the refrigerated section with the almond and soy milk) and not the kind in a can? Yes, I usually use the Silk brand for coconut milk but any kind will do, it’s lighter than the stuff in the can and perfect for this pudding! Hi… is there any alternative for coconut milk??? Can I use ordinary milk ? I think coconut milk tastes best but yes, you can substitute any milk.